Dread Knight was the dictator of the small country of Lieberheim and formed a healthy relationship with the Chicago criminal organization known as the Vicious Circle. Sebastian Khan developed a battle-suit for the man who then became Dread Knight, as a prototype for the amour utilized by Antonio Seghetti, OverLord. In return, Dread Knight allowed the Vicious Circle the use of his embassy in Chicago, which is granted diplomatic immunity from the United States. Sometime later, news was delivered to Dread Knight that revealed he was dying. Desperate to find a way to prolong his life, Dread Knight recruited the Big Mummy and studied his undead physiology for a way to keep him alive. Alas, he was not quick enough and he died while wearing his battle-suit. Dread Knight continued to operate using the brainwaves of its wearer, but without a live body to use it, the dictator became insane, randomly killing his subjects. The S.O.S. were sent into Lieberheim and battled through the android Dreadheads so that they could reach and assassinate Dread Knight to prevent him from murdering anymore of his people. Kid Avenger and he were locked in battle which caused an energy bolt to ricochet off and burn off Dart’s legs. Dragon became enraged and pummeled the villain until he was sure he was dead. Dread Knight was revealed to have been long dead and his DreadHead operatives were deactivated. In the other reality that Dragon ended up on, DarkLord’s machinations never occurred and several soldiers that were killed during his detonation of the original Nega-Bomb were spared this fate. One of these men was a skilled marine named Ronald Winston Urass. He was the child of Bette Urass and Philip Urass and became something of an obsession to the ruthless dictator, Dread Knight. Dread Knight was in fact the marine’s true father and had sought to produce an heir when his quest for gaining immortality looked destined for failure. Ronald Winston Urass was saved from his father on more than one occasion by SuperPatriot, the villain’s nemesis throughout the decades. 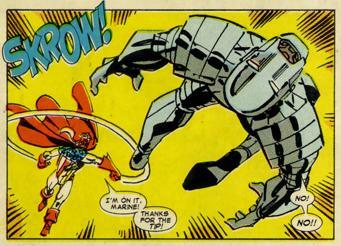 It was on one of SuperPatriot’s final adventures before the loss of his limbs that Urass’ true nature was seen. Ronald Winston Urass stood by and allowed his father to be accidentally killed as he fought SuperPatriot. This act of pure ambition impressed the dying Dread Knight and he finally believed that he had someone who could continue on his legacy. This indeed occurred much later when Urass adopted his father’s amour to extract vengeance against the Dragon for foiling his plans to gain the Presidency of the United States.